Brockhampton certainly knows how to get everyone's attention. The boy band recently recruited none other than Jaden Smith to help deliver some exciting news: the group has officially inked a new deal with RCA Records. During a new clip, which clocks in at under a minute, the SYRE artist shares the news, keeping his signature cool before walking off screen. Brockhampton's leader Kevin Abstract helped elaborate following Jaden's PSA, sharing a statement explaining that the crew has decided to partner with the label and join the likes of A$AP Rocky, Childish Gambino, Khalid, Justin Timberlake and more. "Just wanted to let you guys know that we have decided to partner with RCA and the next records will be released through those guys," he shared. "I wanted to be very clear about this and let y'all know that nothin changes. Videos still diy, music still made in our house, and we're still gonna make the best possible product for y'all. They understood that we wanted to be the biggest boyband in the world and I'm a firm believer in not being able to do everything on your own. Find people whose morals and vision align with yours and follow that. Apple had to get out of the garage at some point. Thanks for giving a f—k and thanks for my management for guiding us in the best possible direction yeehaw." 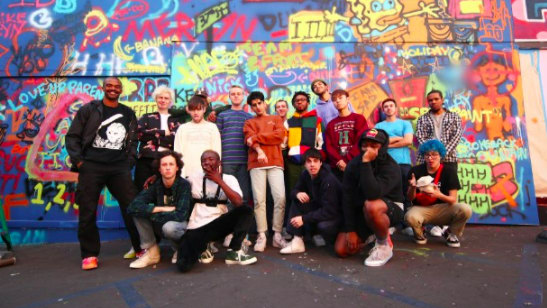 Additionally, it has been revealed that Brockhampton's next album, Puppy, will double as the group's major label debut. Take a look at Jaden Smith helping share the good word, below. BROCKHAMPTON shares their latest music video "1998 Truman"